This post comes from Erika Kociolek, a second year Master in Environmental Management student at the Nicholas School. The Data and GIS staff want to congratulate Erika on successfully defending her project! 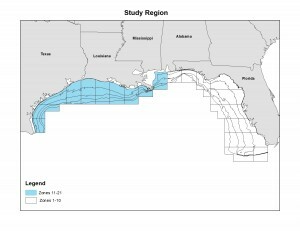 For about 4 months, I’ve been swimming in a proverbial sea of data related to hypoxia (low dissolved oxygen concentrations) and landings in the Gulf of Mexico brown shrimp fishery. I’m a second year master of environmental management (MEM) student at the Nicholas School, focusing on Environmental Economics and Policy. I’ve been working with my advisor, Dr. Lori Bennear, to complete my master’s project (MP), an analysis attempting to estimate the effect of hypoxia on landings and other economic outcomes of interest. 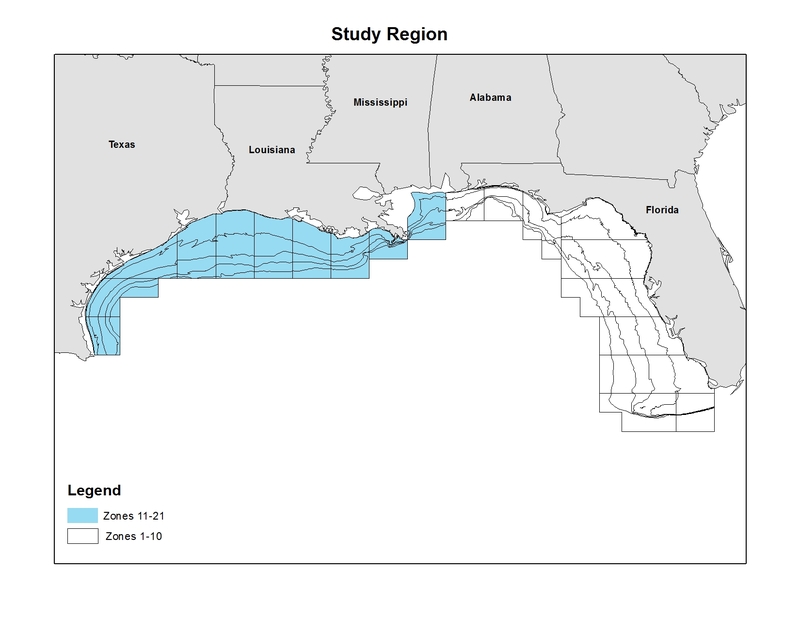 To do this, we are using data from the Southeast Monitoring and Assessment Program (SEAMAP), NOAA/NMFS, and a database of laws and policies related to brown shrimp that I compiled in Fall 2010. By running regressions that difference out all variation in catch except for that attributable to hypoxia, we can isolate its effect on economic outcomes of interest. I’ve found that catch, revenue, catch per unit effort, and revenue per unit effort are all larger in the presence of summer hypoxia. However, if we look at catch for different sizes of shrimp, we see that in the presence of summer hypoxia, catch of larger shrimp decreases and catch of smaller shrimp increases significantly. Getting to the point of discussing results has required a bunch of data analysis, cleaning, management, and visualization. I used R, STATA, ArcGIS, and have even used video editing software to make dynamic graphics representing my results that have improved my own understanding of the raw data. As an example, the video below, showing the change in hypoxia over time (1997-2004), was created using ArcGIS 10. Note: The maps in the video above use data from the Southeast Monitoring and Assessment Program (SEAMAP). Hypoxia is a dynamic and complex phenomenon, varying in severity, over time, and in space; hypoxia in Gulf waters is more severe and widespread in summer. The model I’m using actually takes advantage of this variation to obtain an estimate of the effect of hypoxia on catch and other economic outcomes. To show people the source of variation I’m exploiting, I created this video. These maps are drawing on data of dissolved oxygen concentrations and displaying it spatially. 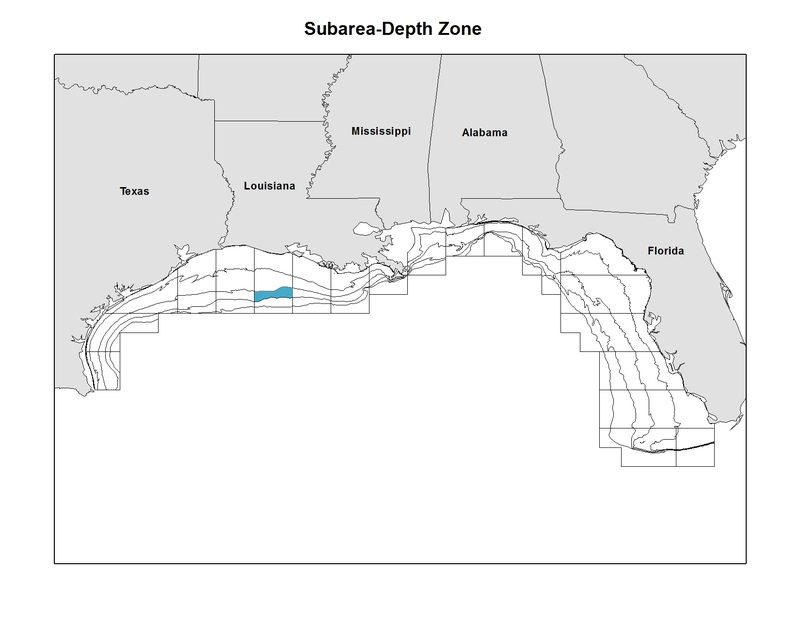 We have dissolved oxygen measurements for most of the Gulf in the summer (June) and fall (December). 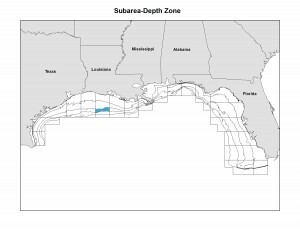 Each subarea-depth zone (see related map) that changes from salmon shading (not hypoxic) to red (hypoxic), or vice-versa, is variation in hypoxia that the models I’m running use to get an estimate of the hypothesized effect. Many thanks are due to my advisor, Dr. Bennear, as well as to the helpful folks at the Data/GIS lab, who have provided invaluable assistance with the data management and data visualization components of this project! This research was funded by NOAA’s National Center for Coastal Ocean Science, Award #NA09NOS4780235. Understanding library users’ research goals remains a key element of the Perkins Library’s Strategic Plan. As part of the Library’s User Studies Initiative, Teddy Gray surveyed the Biology Department in the Fall of 2010 to discover what tools and resources departmental members use in their research, researchers’ data management needs, and the impact of the BES Library closing in 2009. From the 18 interviews of faculty, graduate students, postdocs, and lab managers, we learned–not surprisingly–that nearly all the interviewees use data in their research, most of which they generate themselves. Half incorporate data from others into their work with nearly a third using sequence data from GenBank. Out of the 12 interviewees who generate data in their labs, two-thirds archive their data in existing repositories. In addition to the interviews, this survey also examined research articles produced by Duke Biologists from 2009 in which we paid special attention to their methods sections and citation patterns. From analyzing departmental research articles, we found out the nearly 40% of the authors deposited their research data into either GenBank or a journal archive. Only one author deposited data into another existing scientific repository. Again nearly 40% of the authors used a general statistical package in their work (SAS and R being the most popular), while nearly half used a biology-specific statistical tool. Almost everyone interviewed uses statistical tools in their research with over half now using R. Many also use biology-specific statistical programs. All but one of the interviewees prefer the online versions of library material over the print. A third use image databases–primarily Google Images–in their teaching and presentations; however, only one interviewee knew of subject specific image databases such as the Biology Image Library. And while some interviewees missed the convenience of easy shelf browsing with the BES Library so close by, all are happy with the daily document delivery to the building. We are grateful to the Biology Department for their support (and time) in conducting this survey and plan to use the results as the basis for library services. Data and GIS Services is always interested in hearing more from Duke researchers about the nature of your research! Please let us know if you would like to discuss your research interest and/or library needs.